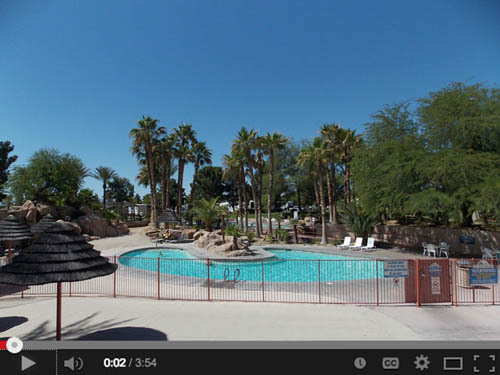 The Oasis RV Resort in Las Vegas is one of the nicest parks we’ve visited. It is a very large park with over 700 spaces but it certainly does not feel that big. The sites are spaced decently with many pull throughs. Trees are scattered about with just enough regularity to cause you to forget that you are in a desert. The staff was friendly and the resort has two pools, a putting course, a restaurant, store and ballroom for larger groups. Price was reasonable for a resort and it is easy on/off from I-15. We would recommend this resort for your next Vegas RV trip. Huge luxury RV Park just off Las Vegas Blvd south of the Strip. Very Vegas. Security guard checks you in and directs to very large lobby/store/restaurant/bar. Roads and sites are paved, with red gravel and patios. Most have a palm tree. Sites are closely spaced and there isn’t much ambience or scenery, but they have it all, amenity-wise. Two huge pools, with one designated a family pool and the other reserved for adults only. Nice touch. Jacuzzi. Full 18 hole grass putting course. Large dog runs and bathhouses scattered throughout the park. Lots of 24/7 traffic noise from adjacent I-15. Entry procedure requires security guard to fill out form with vehicle license plates for new arrivals takes several minutes while all other entry traffic must wait in line. Should have separate lane for returning guests. Shopping nearby on Blue Diamond and the casinos are about 3 miles away. Bus is possible with a connection at the factory outlets. Bike riding in the park is fine, but not really survivable out on the vegas streets. There are several bike trails in the area and we rode the Union Pacific rail trail in Henderson, which included a Cappriottis Sub Shop on the route! Lake Mead is about 30 miles away and has launch ramps to get kayaks in the water. Second time visiting this park, but the last. Rude -condescending staff when issues arise. Security damaged my truck. Their response was "we are not responsible for any damage." Internet was non-existent. Their response was "we have over 1000 connections,. That is normal. Try connecting late at night. Call the Internet provider to troubleshoot your equipment." Really??? Don't say you have Internet if you can't offer it. Was going to try the cafe but the cook told us they were closing in 5 minutes and to go elsewhere. My son was asked to leave the lobby because they saw him alone and assumed he was under 14. They were wrong. Seems like park turns a blind eye to some and not others. Saw a neighbor washing their jeep in an empty spot and employees just drove by. Saw minors in adult pool. Saw teens canonballing into pool over and over - security just walked on by. This is truly an Oasis in the desert, even if you are almost downtown Las Vegas. The resort has nearly 1,000 sites ranging in amenities and location. You can "rough it" or set up in the lap of luxury at an affordable price. Very convenient to leave from in one direction but not as easy from the other. If you can't find something that you like here, you better stay home. Very nice staff. Breakfast and lunch on site. Good Sam convenience store on site as well. Many local service providers if you RV needs work. Stay and enjoy. If your are visiting Las Vegas this is a great park to stay at. It is right off the strip and easy to get to and from the casinos via an uber ride or you can drive yourself. The facilities are very nice especially the pools. It is a very busy park so be sure to make reservations early. Convenient location to Las Vegas. Nice pool area, restrooms good. A bit expensive. Stay away June through September if you are not used to the 100+ temperatures. Wifi and cable are adequate. What can you say about Vegas hotter than hell but this is a good campground. Beautiful pool and club house. the spots are easy in and out and everything works well. We have stayed here many times and will again I hope. This park is tops in most every way. However, there is one thing terribly wrong. For a park of this stature, to not have air conditioning in the restrooms is unforgivable. This is the second hottest place in the country and that alone merits a/c everywhere. I don't know how they ever achieve a "10" rating for their restrooms. Evidently, the GS rating staff never visited this park in the summer and used the restroom. Taking a shower here is like being in Miami in the middle of the summer...you never get dry. This was a beautiful resort, one of the nicest ones I've stayed in. Level roomy lots, clean, two pools, one for families and one adult. Nice community area, store, lending library. I used the washers, they were fine, reasonably priced, laundry room clean. Did not use the restrooms. The only reason I did not give it 5 stars was that with over 700 rental spaces, there was only 2 internet ports and getting on was next to impossible and when you did get on, you got kicked off quite often. I even called the IT service, and they said nothing they can do, too many people on it. We stayed 6 nights to see some of the sights in the area and waiting out bad weather. The park is a short drive from I-15 (Exit 33: NV-160) along multi lane city streets. Getting into the park from I-15 is much easier than getting out of the park onto I-15. The entrance poses a little bit of challenge due to the portico that you drive thru and the angle of the road thru the portico. Access to the park is controlled by the staff at the gate. The interior roads are paved. The interior roads and turns are sufficient to maneuver larger RV’s. The sites are a mixture of back-ins and Pull thrus. The parking pads are concrete. The P/T sites were long enough to say connected to a toad. Sites had sufficient room for opening slides. This park seems to understand the simple concept of the importance of a flat, level site as the sites were generally level and flat. Some of the sites appear to be extended stay sites. Distance and gravel areas establish privacy between the sites. They have full hook ups – water, electricity (50/30/20 AMP), & sewer. The sewer connection was at the ground so it was easy to establish a downhill flow. There was an outside table but no fire pits. There weren’t many trees on the side West side of the park but there were more trees on the East side so satellite reception would be dependent upon your site. Park brochure showed a 36 cable channel lineup. The park provided WiFi was good. It was password protected. Our Verizon WiFi hotspot worked well. Didn’t try the NET10 phone so don’t know about cell phone reception. There were several designated fenced pet areas with gravel surface located throughout the park. There were bag dispensers and collection stations for waste in the fenced pet area. There was sufficient area to walk dogs along the park’s roads. There was one area of the park where pets were not welcome. We didn’t use the pool, hot tub, restrooms or laundry. We would probably stay here again if traveling through the area. TIP: This is truly a ‘resort’. It offers many services for both humans and RV’s. Many of the RV services will come right to your site. West side “Deluxe” P/T’s would be our choice. Back in sites #208 to 272 where along the interstate so there was some traffic noise there. Wow this place rocks. of The location is south of the strip. Just off the interstate 15. Some noise from the airport but not bad at all. Spaces are kind of narrow but i had no problem parking my 35 footer. The clubhouse is just what you would expect in Vegas. Would i stay here again you bet. LOL . This was a great place to stay. I would highly recommend. Very clean, friendly service, close to downtown, spacious. I was very comfortable staying there and would highly stay here again. Wow, this is a very nice resort. All the facilities are very nice and very clean. It is a short hop to Silverton or Cancun and all kinds of restaurants or even the strip. The dog parks are close to wherever you are, trash cans a short walk, bath-shower buildings right close by. This is a big park but can seem cozy or roomy at the right times. Loved it here. We stay in Oasis every time we are in or passing through LV. Nice park, away from but close to the action. Freeway noise if you are in the west side of the park. A little pricey but worth it for the facilities and 24 hour guard. We had a pull through and was adequate for our MH and a toad. NOTE: If you do NOT have a dog, this is 5 stars, all the way! It hurts to give this place 4 stars for overall, I SO want to give it 5... but this is a "dog tolerant" park. It shows that they recognize that most of us RV'ers travel with our furbabies, so they've made "compromises," but that they really don't want them there. They do have "dog walks," and some dog pens they call dog runs; they are about 20' by 18', certainly not big enough for pup to stretch his legs after being cooped up in the RV all day traveling. The dog walks are all on concrete or rock, and I worry about little paws getting singed in the Vegas heat. Fortunately for Jack and me we were there in November when heat was not an issue. Everywhere you look are signs saying to keep your dog off the grass. All we dogfolk know how great that grass feels under your paws. It was a real heartbreak to walk alongSIDE the grass, making him walk in the gravel when he wanted to walk in the grass. The signs are somewhat vague as to if they mean just THAT grass, or all grass. I've never seen so many "no dogs" signs in my life! Ok, so OTHER than that, let's talk about the park. It is wonderful! Pricey, but wonderful! Still cheaper than the hotels, and you get your own space. Every possible amenity, SUPER nice folks, REALLY upscale. One of the few RV Resorts that can use the name with impunity. This is a resort in every sense of the word. Near to grocery and loads of stuff; but not right in the casinos. I find that a plus. I was there for the Las Vegas International Horse Show at the Southpoint hotel (they do not allow dogs at all), and it was super easy and quick to get there and back. Not far from the strip, I did see a few peeps getting taxis over and back. Gateman out front (darling man who saluted), clean clean clean. This place sparkles. If only they would be more welcoming to our furbies, this place would be perfect. Great pools, nice little store, very nice cafe and helpful people - The park is very well maintained, has clean everything and good security. 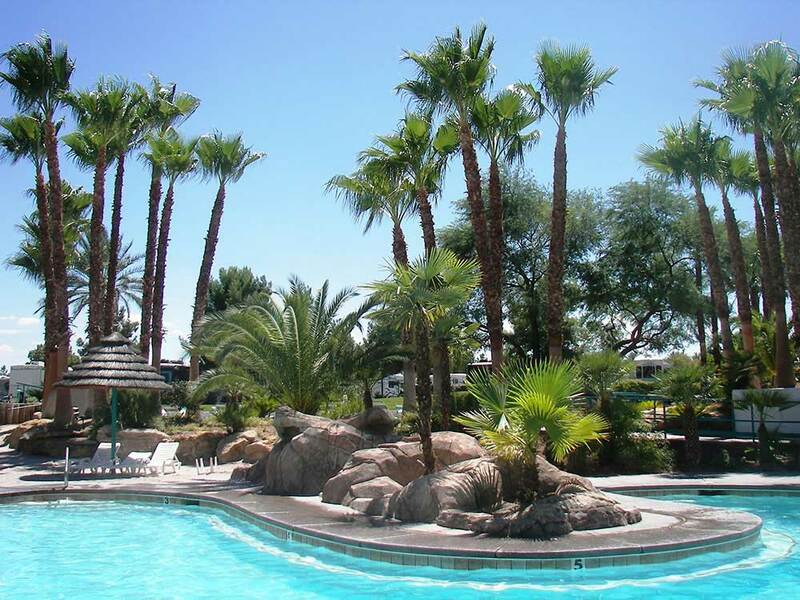 The location is ideal for the Henderson/Las Vegas Valley with good shopping nearby and a straight shot to the strip. We stayed here for a few days. Site was nice and level, and we were lucky enough to have shade trees backed up to the mini golf course. This is a resort atmosphere with 2 pools, small restaurant, and store. Bath/shower houses were excellent. Great propane refill service--they pickup and deliver rite to your site. Far enough away from the Strip to not have to deal with that, but the drive to it was not too bad. 24 hour security and guarded access made us feel safe and secure. The cost per night was high but worth it. We stayed in a 32" TT and would stay here again.